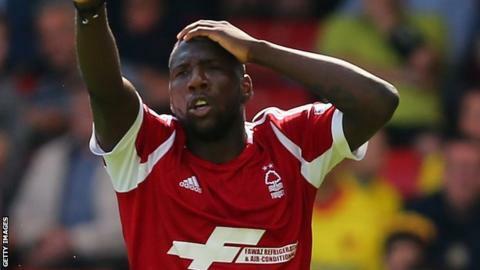 Nottingham Forest striker Ishmael Miller has joined Yeovil on loan until January, along with Liverpool's Adam Morgan and Everton's John Lundstram. Miller, 26, scored six in 30 games on loan at Middlesbrough last season but has failed to score in seven matches on his return to Forest this term. Forward Morgan's loan will be made permanent in the new year. "I'm really pleased with the deals we've done," Yeovil manager Gary Johnson told BBC Somerset. Morgan, 19, has played three Europa League games for Liverpool and previously had a loan spell at Rotherham, while midfielder Lundstam, also 19, played 14 games for Doncaster last season. Speaking about Morgan's move to Huish Park, Johnson added: "The boy had a lot of options. We've taken him until January and then we've got a deal for the next couple of years after that. "He's a great prospect and I think he's ready to play Championship football." Miller started his career at Manchester City before making a six-figure move to West Brom in January 2008. He spent three years with the Baggies before signing for Nottingham Forest, where he has made 30 appearances, scoring four goals.